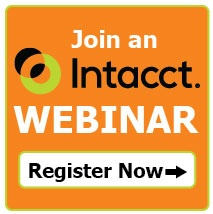 Intacct provides the deep, professional-strength accounting and financial management functionality you’d expect to find in expensive ERP systems, and the flexible cloud infrastructure makes it easy and cost-effective to integrate, configure, and extend the system to the exact level of customization your business requires. And it’s fast. Many customers have been able to get started using Intacct in as little as 30 days. If you need additional customization, BTerrell Group has the unique ability to have solution tailored, through our sister company, CodePartners. Intacct is designed for maximum extensibility. You’re not boxed into a generic, standard solution that doesn’t fit your specific requirements. Intacct uses open web services to integrate with the broadest set of leading applications. So you can cost-effectively create an interoperable system of best in class applications—while preserving your investments. And web services ensure easy accounting integration with applications you deploy in the future as well. Take advantage of dozens of pre-built integrations with leading applications that deploy quickly and easily. For example, Intacct integration with Salesforce CRM is the highest-rated integration module in the Salesforce AppExchange. Take a look at the list of Intacct-ReadyTM pre-built integrations.